The sacred Catalan monastery of Montserrat is located on top of a range of craggy mountains some 60km north-west of Barcelona. It is one of Spain’s most important pilgrimage sites where more than two million annual visitors come to visit ‘La Moreneta’. This is a small statue of the Virgin of Montserrat which stands high above the main altar of the 16th century Basilica. 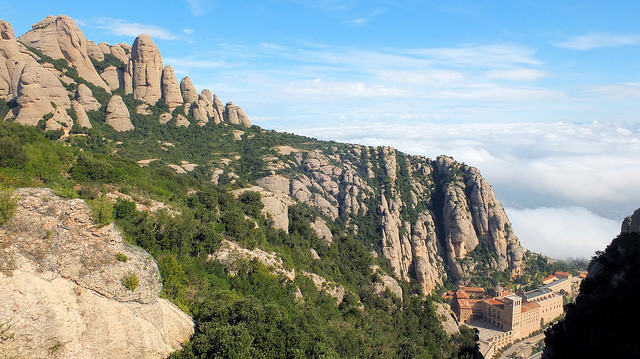 Montserrat excursions from Barcelona are popular with visitors who take travel on daily sightseeing tours or travel independently by train from Barcelona Espanya station. Whilst you can visit Montserrat all year round you should try to avoid Sundays if at all possible as that’s when many locals head there making it something of an ordeal trying to move around. Two other dates when the place is extremely busy are 11th September (National Day of Catalonia) and April 27th (La Moreneta’s saints’ day). The Museum of Montserrat is also worth a visit to see some works by El Greco, Monet, Picasso and a number of other notable artists. In addition, visitors can walk to the the Holy Grotto on the mountain where children first saw their visions of the Virgin Mary. There was once a legend linking Montserrat with the castle of Monsalvat in the tale of the Holy Grail but this is not now thought to have been justified. First references to a monastery here can be traced back as far as the year 880 when local children are said to have seen an image of the Virgin here. In 976 this was handed over to the Benedictine order. Monks from the Ripoll and Vich monasteries came in 1025 to commemorate a vision of the Virgin. The presence of the wooden sculpture of the Madonna and child known as ‘La Moreneta’ (‘the Black Virgin’) even at this stage meant that pilgrims made the journey to the mountain retreat. It was Pope Benedict who gave the abbey independent status and, at the end of the 15th century, a printing press enabled the abbey’s prominence to be heightened even more. Also in the 15th century the ‘Escolanía’ was founded and is reputed to be the oldest music school in Europe. Today its pupils, the Montserrat Boys’ Choir, still sing in the basilica at least once a day during most of the year. The founder of the Jesuit movement, Ignatius Loyola, spent time at Montserrat in 1522. The low point of the abbey’s history came in 1811 when it was sacked and destroyed by the French and then abandoned during the Carlist Wars. There was a complete rebuild of the monastery later in the 19th century. By Car: Montserrat lies some 50 km northwest of Barcelona and is accessible by road by taking the A2 expressway to Martorell. From there continue on the C1411 via Olesa to Monistrol. There is a suitably scenic and twisting road from Monistrol. Alternatively, just after Olesa you will see a signpost for ‘Aeri’ which is the lower station of the cableway up to the monastery. Bearing in mind that parking near the monastery can be very difficult this is probably the better choice. By Train: Many visitors prefer to go by train as you can travel directly there from Espanya rail and metro station in Barcelona. This station is accessible on both the red and the green lines of the Metro system. When you are buying your train tickets in Barcelona you will need to decide whether you wish to going up the Montserrat Mountain by cable car or on the funicular railway as you’ll be getting off at different stops depending on your preference. Cable Car: You can take the train as far as the cable car (Aeri) which takes you up the mountain. This only a 5-minute journey but it is a spectacular one across the Llobregat valley. Bear in mind that you do have to stand. Funicular Railway: The Cremallera funicular takes about 15 minutes but is not quite as scenic as the cable car. However, it is a lot more comfortable as passengers have the luxury of a seat. Wheelchairs can also be accommodated. The tickets are the same price and the journey time from Barcelona is just about an hour. There is an additional ticket available known as the ‘Tot Montserrat’ which includes entrance into the Montserrat museum and lunch at the restaurant there. By Tour Bus If you don’t have your own car and don’t fancy taking public transport then you can easily book one of the numerous coach excursions to Montserrat which are operated by some of the big tour operators in Barcelona. Went up to Montserrat a few years ago and have never forgotten it. It is an incredible place to visit, the walks and the views from above the monastery really are something else. Thank you Gerry for bringing back a few memories! Montserrat was definitely one of the highlights to my first trip to Catalonia. I was there is June on a weekday and it was not overly crowded. They have lovely little market where they sell delicious cheese, bread, and fruit. The scenery is beautiful. After your visit, take in little cava tasting nearby! Thank You to tell the history of Monserrat I think one of most beautifull Church I have seen. The place the building the choir are delighfull. Gerry, thanks once again for highlighting yet another gem. Spain is a wonderful country – great people, incredible history! 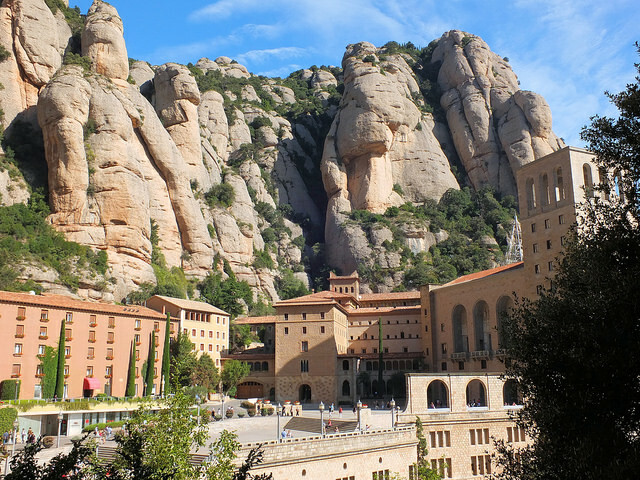 We’ve added Monserrat to our ‘places to visit’ when we head back to Spain in 2019!